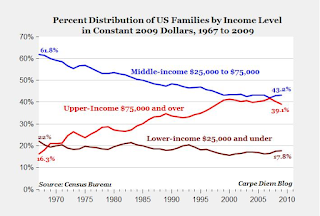 Is the middle class disappearing into the upper class? Depends how you define "upper class." And "constant dollars." I don't find this post very persuasive. First, $75,000 household income is hardly "upper class." You can't even buy a house on that income in many areas. Second, those "constant dollars" are deflated by CPI or some similar measure, which understate inflation due to flat screens, iPads, and computers getting cheaper while the cost of necessities (housing, food, and energy) increases. I am certain that $75,000 "constant dollars" in 1967 bought a lot more house, food, and gasoline than it buys today. Finally, this is household income, and largely reflects the shift from one-income families to two-income families. Needing two incomes to scrape by is supposed to be good news? On Friday, when discussing with friends the San Diego Democratic Party's support for well-known creep and serial sexual harasser Mayor Bob Filner, I commented, "The only thing worse than a slimeball creep to a Dem voter is a Republican." And now we have confirmation of that point from one of the victims. She said the mayor did this to many women, and many people knew about it. “It’s one of the worst kept secrets in town,” Woman One said. "Everyone in the power structure knew this,” she said of people in local government. Huong is among millions of Vietnamese who hold an estimated 300 tons to 400 tons of bullion to store their wealth -- valued at as much as $19 billion at domestic prices and equal to official U.K. holdings -- a legacy of more than a century of war, revolution and economic turbulence. The central bank wants to convert the hoard, much of it smuggled in, into dong deposits to strengthen the currency, which has slid 21 percent against the dollar in five years. Private gold holdings “reflect both the Vietnamese cultural values as well as the lack of confidence in the dong,” said Trinh Nguyen, Hong Kong-based economist at HSBC Holdings Plc. “High inflation and depreciation of the dong in the past have caused people to keep their savings in gold.”Instead of giving Granny the hard dong she so desires, the government of Vietnam is, like so many other governments around the world, making it more difficult and expensive for her to use her solid gold substitute. A mother visiting the Escondido library the morning of June 22 told police that a strange man followed her around the aisles. The woman said she was at the library that Saturday with her two children, aged four and six, when the man eventually came close and then touched himself and winked at her children, police said. After thinking on the matter for a week, the mother contacted Escondido police on June 29 to report the incident, according to police Lieutenant Neal Griffin. You might want to work on that profiling algorithm, Zuckerberg. I'm happy to click the DSCC link and cost Chuckie Schumer and Harry Reid a buck or two, though. Obama henchman Janet Napolitano, of Homeland Security thuggery and zero academic credentials, appointed to lead University of California. For background on the bloated and corrupt University of California, please see here, here, and here. The lawsuit, filed in U.S. District Court in Washington, alleges that the Treasury and the regulator for Fannie Mae and Freddie Mac violated a 2008 law that put the two mortgage companies into conservatorship as they faced insolvency at the height of the U.S. financial crisis. The Treasury Department amended the bailout terms last year, forcing Fannie Mae and Freddie Mac to hand over most of their profits to the government, replacing a requirement that the companies pay quarterly dividends of 10 percent on the government's nearly 80 percent stake. The suit names both Treasury and the Federal Housing Finance Agency (FHFA), which regulates Fannie Mae and Freddie Mac. Perry Capital, which began investing in both firms in 2010, claimed in the lawsuit that shareholder value was impaired when the government instituted a "dividend sweep." And now the moment of truth arrives. Can Zimbabwe Ben seamlessly hand off a centrally planned economy to a new, self-sustaining free market economy? Call me a cynic but I doubt it. Declaration of Independence:He has erected a multitude of New Offices, and sent hither swarms of Officers to harrass our people, and eat out their substance.